Teris Sevuro is a Dunmer crusader who can be found in the Tribunal Temple in Ranyon-ruhn. A proud, steadfast, and pious member of House Indoril, he will speak in length and with pride to the player about topics related to both his house and his Temple faith. 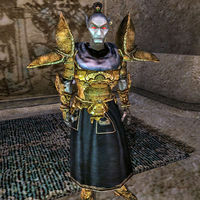 Though the citizens Ranyon-Ruhn think it is odd to see an Indoril so far north in the lands of the Telvanni, he says he is simply there to guard the sacred site of Ranyon-Ruhn temple.